With 3 official national championships (and an 11-0 season in 1966 that did not result in being #1), the Alabama football team dominated college football with Bear Bryant at the helm. 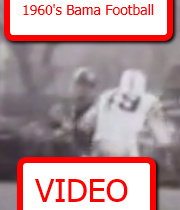 Watch this video about the Alabama teams of the 60's as presented by Keith Jackson. You will hear stories about Bear like when he kicked the locker room door off its hinges in 1965 to stories of close games. The video is a fascinating look into this dominant era of Alabama football.